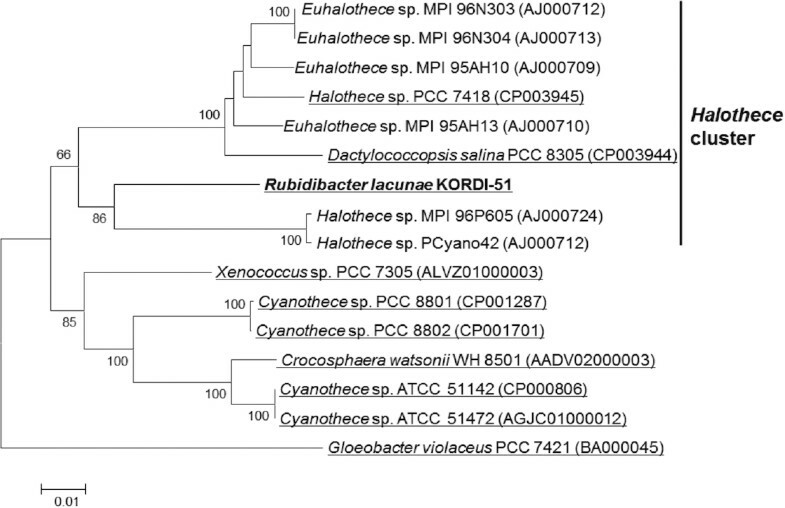 By phylogenetic analysis of 16S ribosomal RNA genes (Figure 1), R. lacunae KORDI 51-2T was clustered into the Halothece cluster. 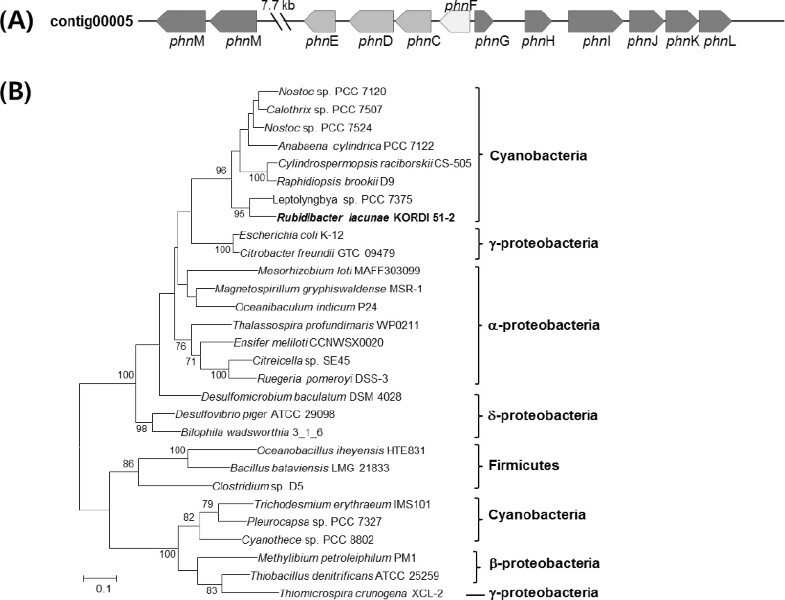 Four Euhalothece strains belonging to the cluster were isolated from a hypersaline pond (strains MPI 96N303 and MPI 96N304) or a solar evaporation pond (strains MPI95AH10 and MPI95AH13) in Mexico . 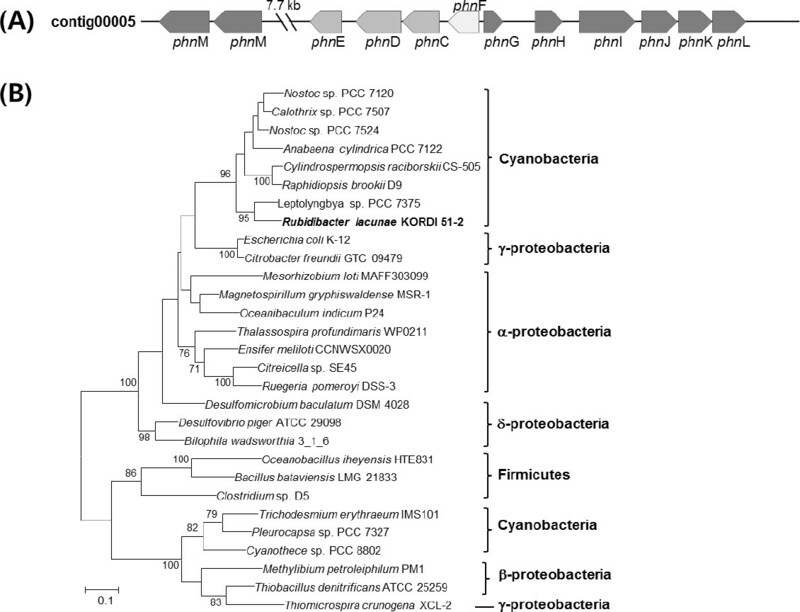 These strains showed sustained growth between 6–16% salinity, and several strains could grow even in NaCl saturated brine, suggesting that they are at least extremely halotolerant cyanobacteria . 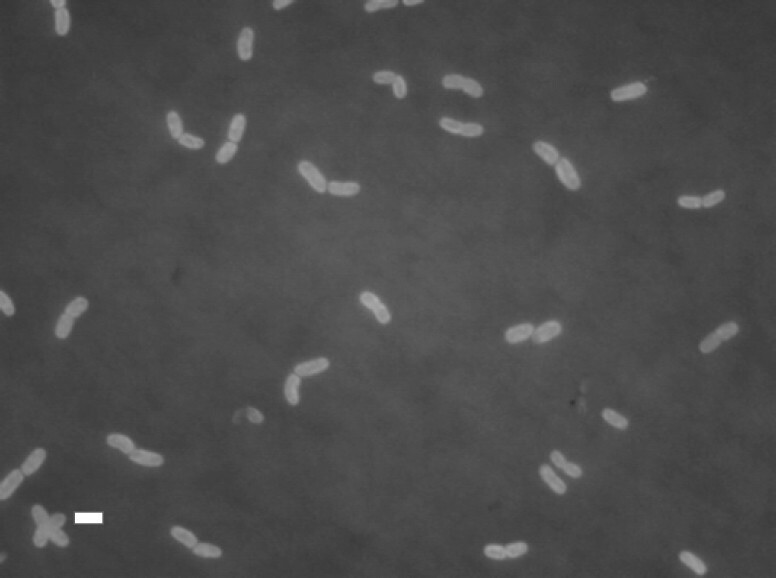 Dactylococcopsis salina and other Halothece strains belonging to the cluster were also isolated from various hypersaline environments, such as a solar lake in Egypt, a solar evaporation pond in Spain and hypersaline lagoon in Australia [2,3]. On the contrary, R. lacunae KORDI 51-2T was isolated from natural seawater and able to grow at a salinity between 2 and 7% (Table 1). In addition, R. lacunae KORDI 51-2T contains phycoerythrin, which differentiated it from the other strains belonging to the ‘Halothece’ cluster . The epifluorescence micrograph of the cells and other classification and general features were shown in Figure 2 and Table 1, respectively. Epifluorescence micrograph of R. lacunae KORDI 51-2T. The picture was taken under green excitation and then converted to gray scale. Bar, 3 µm. R. lacunae KORDI 51-2T was grown in a 50 ml culture flask filled with 50 ml of modified f/2 medium in which silicate was omitted and ammonium chloride was supplemented (final conc. of 100 µM). The culture flask with inoculum was incubated at 25oC at about 20 µE m−2 s−1 (light:dark=14:10) for 3 weeks. Genomic DNA was isolated using Qiagen Genomic-tip 100/G (Qiagen) according to the manufacturer’s instruction. The gene prediction and functional annotation of the genome sequence was basically performed within the Integrated Microbial Genomes - Expert Review (IMG-ER) platform . The tRNAScan-SE was used to find tRNA genes . Ribosomal RNA genes and ncRNA were predicted using RNAmmer  and Infernal  using the Rfam model , respectively. 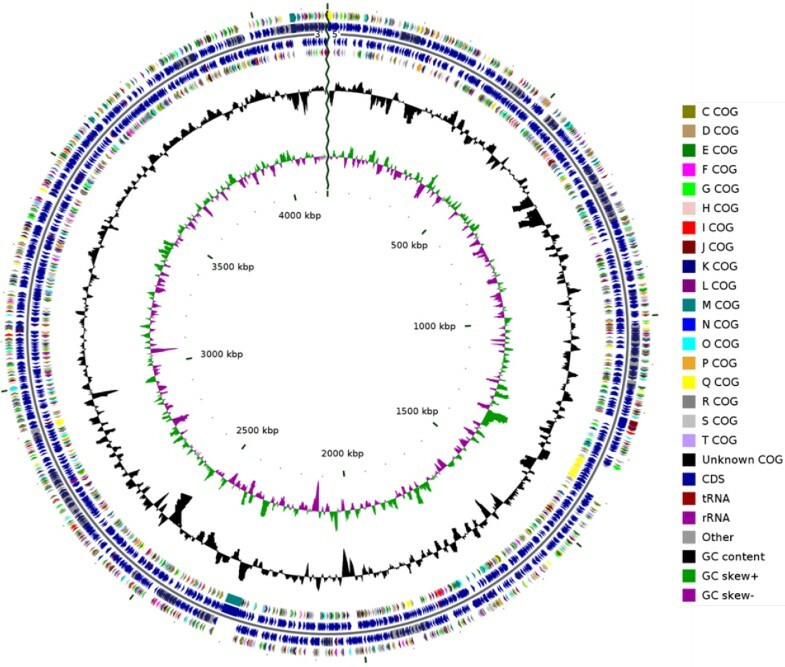 Identification of protein coding genes was performed using Prodigal , followed by a round of manual curation using the JGI GenePRIMP pipeline . The predicted CDS were searched using the TIGR-fam, Pfam and COG databases implemented in the IMG systems.